Banana blueberry smoothies are one of our favorite breakfasts and snacks. They are delicious, nutritious and so easy to make. My kids go crazy for these smoothies! I really wish I had known about making smoothies sooner, but for the past few months they have become a staple around our home. 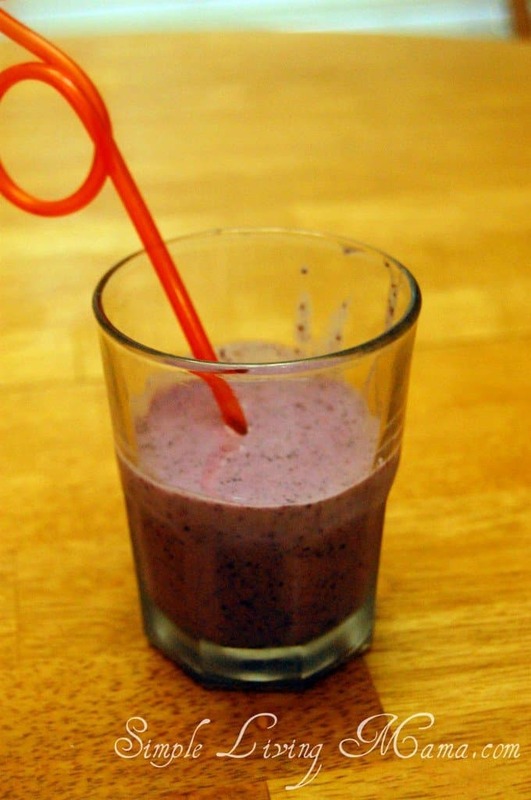 To make a banana-blueberry smoothie you will need one banana, a handful of blueberries, honey, and yogurt. You will also need a liquid of some sort. I like to add orange juice, but was out today so I added a little bit of milk. I usually use frozen fruit. If you are using fresh fruit you will need to add some ice, too. A few tips: My kids usually only eat half of a banana at a time, so I will cut the banana in half and freeze them in Ziplocks. The honey below is the best honey I have ever had. It’s raw, local honey that we buy at our Farmer’s Co-Op. It’s delicious. 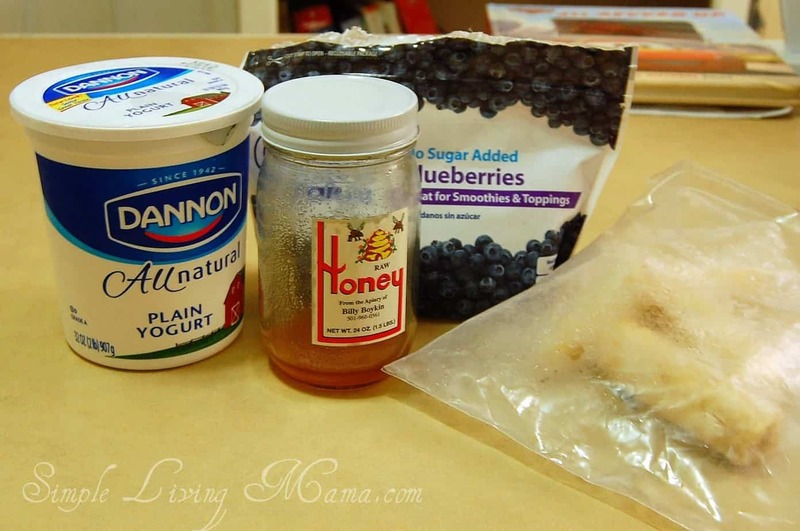 You can use a flavored yogurt and omit the honey. All you do is put one whole banana in the blender. I add about four or five generous tablespoons of yogurt, a tablespoon or two of honey, a handful of blueberries, and about a half cup of juice or milk. Just whirl it all together and pour in glasses. This recipe makes two grown-up smoothies or two kid and one adult smoothie. Combine all ingredients in a blender and blend. We actually just went to Whole Foods for the first time on Monday and I found that they had local raw honey. I bought some because we had just run out and won’t be going to the Co-op for a while! Thanks so much for stopping by!